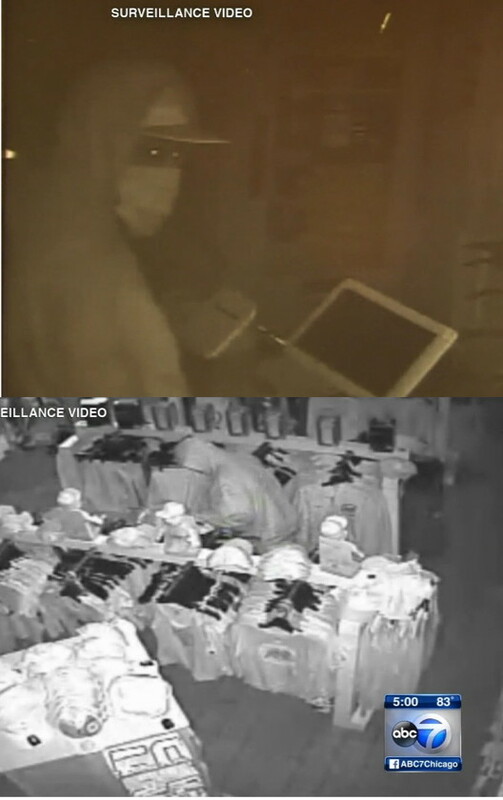 The burglar(s) in action at Lakeview Smoke Shop (top) and Clark St. Sports. A spree of local business burglaries is rolling into its third week. Salon Envy at 2658 N. Halsted became the latest shop to be victimized. Employees found the back door popped open as they arrived for work Friday morning. Detectives are reviewing video from nearby surveillance systems. Police have issued two alerts to businesses recently, warning of late-night burglars who break in through front glass as well as late-night burglars who break through back doors. ABC7Chicago's Ben Bradley this week aired surveillance videos that show images of a man burglarizing two of the stores. • Lutz Bakery, 2458 W. Montrose, July 18. • Clark Street Sports, 3465 N. Clark, July 6.